Child labour is one of the major issues that India need to look upon, not only for the children’s future, but also for the healthy and sustainable development of Indian economy. The fact is deduced mainly basing on the fact as most of the citizens believe that the “children are the future of any nation, irrespective of the fact that the nation is either developing or developed”. Child labour can be defined as the phenomena where the children are involved directly or indirectly in an economic activity, on a full-time or part-time basis. Child labour swallows the childhood of the children, having a major impact on their physical and mental abilities. There are many reasons behing this growing child labour rate in India like, poverty, lack of good schools which are financially affordable and also the growth of informal economic activities. However, according to the international labour organization (ILO), any normal work activities which does not affect the child, not interfering their schooling, physical and mental conditions is not considered as child labour. And also they set some of the legal acts which prosecute the child labour, but even then, the growth rate of child labour in India is quite alarming for the nation. Given below are the statistics of the growth of child labour belonging to various economic groups of India based on rural, urban, female, male etc. Taking a look at the present scenario as per the statistics, India has the largest number of working children under the hood, ranging from about 60 million to 150 million. Reports and researches say that these children are made to work on an average of 16 hours per day. Just by reading the above sentences, one can surely feel the amount miserable and down-casted these children’s lives are. According to the lega report of the nation, there are about 20 million children under child labour, whereas other sources argue that they are about 50 million which are identified and yet many other cases to be identified. However, in almost all of the cases that are identified, poverty has been the main root or the increasing child labour in India. This growing child labour is eradicating the pretty childhood of many children, denied of their right to survival, educations, development, leisure and play, opportunity to develop personality, talents, mental and physical abilities, adequate standard of living and protection from abuse and molestation. The major cause of the growth of child labour has been deduced to be as the poverty line in India, UNICEF also stated the same. The problem mainly occurs in the rural and impoverished parts of India, where the children does not want to work in the way, but are forced to do so as they are not provided with any other alternatives. Lack of availability of good schools and teachers add more to the problem. Good schools here refer to the schools are which have affordable fees. Also many rural and panchayati areas does not have adequate schooling facilities. Sometimes when the schools are even available, they are located at very far-away places, which make it difficult for the small children’s transport. Quality of education also matters a lot as it sometimes makes the parents wonder if at all going to school is really helping their children or not. This lack of availability of quality schooling is the main thing that is driving the children towards harmful labour. Especially, the most notorious thing in government established schools, even when the children show up after facing so many obstacles, the primary teachers won’t show up 25 percent of the time. There are already some best initiatives taken by the government towards preventing the growth of child labour in India. One of the best and major way to do this is by establishing various child labour prevention acts, which abide by the law. A committee named Gurupadaswamy was formed in the year of 1978 to prevent the child labour in India and to find a means to tackle this growing problem. However the act was actually brought into practice in the year of 1986. In the year of 1987, ministry of labour and employment was brought into act to re-habitat the child workers since year 1986. 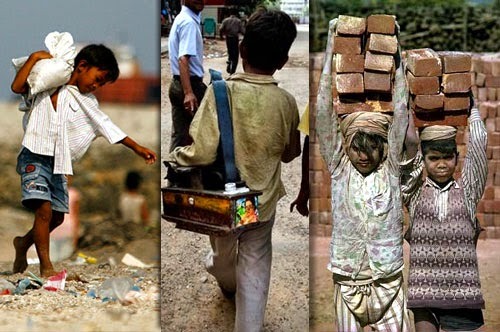 Not only the government, but also many non-government organizations (NGO’s) should be formed to stop this child labour. A famous non-government organization named Pratham was also one such Ngo formed against the child labour, and in a operation they made in some of the major established industries, to the utmost shock of the nation, a huge number of about 500 children were found in the claws of child labour and they were rescued by the team Pratham. So, both government and also the citizens of the nation should feel the inner responsibility to prevent the growth of child labour in India together and should also act together.